Off-grid solar power is gaining attention for video surveillance. In this article, we examine what video surveillance applications are typically used with solar power, examine what key factors affect the design and cost of solar power systems, and look at example installations in different geographic locations to compare pricing and aesthetics. What video surveillance applications is solar power commonly used for? Remote locations where other power sources are not available. Locations where power may be available but is not physically or economically feasible to be installed as compared to the cost of solar power. Installations where fast deployment is critical. Temporary or portable cameras that need to be moved to different locations. Environmentally-sensitive locations or communities which are willing to absorb the additional cost of solar power in an effort to be environmentally friendly. Although some manufacturers are selling prepackaged fixed and mobile solar powered platforms for video surveillance, there is no “one size fits all” solution for solar power systems for video surveillance, which we will illustrate. There are simply too many critical elements that vary widely across geographies and application types. The cost of adding in solar: Solar can be quite expensive and be easily more expensive than the surveillance equipment itself. The aesthetics of adding in solar: Between solar panels and enclosures for panels, many users may object to the aesthetics or logistics of adding a significant amount of equipment. The variation of cost and aesthetics: Depending on the type of camera and the location deployed, the severity of cost and the aesthetic impact can range significantly. 'Low Power' Example - An IP camera with low power requirements. For this example, two outdoor pole-mounted PoE fixed cameras and wireless mesh node are installed in a remote location requiring solar power. To begin the solar power sizing calculations, the system’s load needs to be determined: The wireless mesh node uses 12VDC input and draws 4A for a total of 48W of total power, (including powering the 2 PoE cameras), 48W x 24 hours = 1152 watt-days of total load. Looking at the table, areas with colder climates or more consecutive sunless days, additional equipment is required, which can increase price significantly. The Tucson system is less than 40% of the cost of Seattle’s due to the overwhelming disparity in hours of sunlight, battery efficiency and sunless days. The Tucson system required about 1/4 of the solar array capacity as compared to Seattle, but was just a little more than 1/3 of the price, which is not a linear scale. Doubling the Load: The addition of two 45W LED illuminators (at 50% duty cycle) to our Kansas City example almost doubles our original system load. 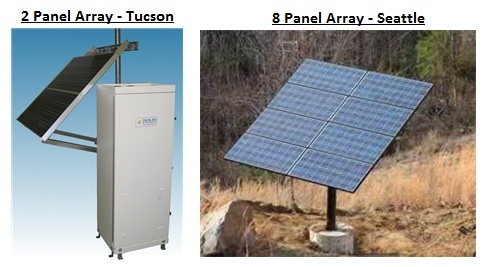 However, the calculated price of the solar equipment package is approx. $15,000, which is only about a 60% price increase. This will be approximately the same size system as our Seattle example above with the same solar panel array but fewer batteries. Stand-Alone 5W Camera: Using our Kansas City example again and substituting one stand-alone 5W low power fixed camera (with internal SD storage that is not monitored and accessed manually), we have a total load of 120 watt-days, about 10% of our original load. 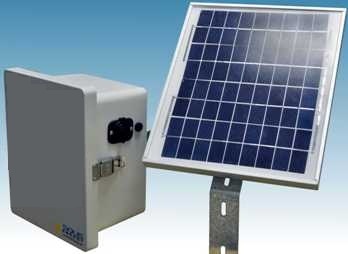 However, the calculated solar equipment package price is $2,600, about 30% of the original price. With this low of a power load, this installation may be a good candidate to use a portable solar power system typically used for boating or camping that costs about $500, as shown below. Locations were selected to obtain a sample from each zone of the insolation map. The number of direct hours of sunlight, average low temperature of the coldest month, and battery efficiency figures are from the solar manufacturer’s calculation tables. The calculated array watts and battery requirement figures are the results from the solar manufacturer’s calculation tool. Wattage calculations include a “harvest” factor. Although AGM batteries are more efficient in colder climates, 102AH G 31-Gel size gel batteries were used in all installations for consistency. Nominal watts figures reflect the closest pre-packaged solar kit from this particular manufacturer. Estimated price is the MSRP for the solar equipment package only, and does not include installation labor. The equipment’s electrical load is the biggest factor in the size and cost of a solar power system and the only one that the video surveillance designer has any measure of control over. Evaluate different brands of equipment, comparing the power requirements listed in the manufacturer’s data sheets. Use equipment with the lowest overall power consumption. Focus on selecting equipment that uses 12VDC input power and keep the voltage uniform for all devices, eliminating the need for transformers. 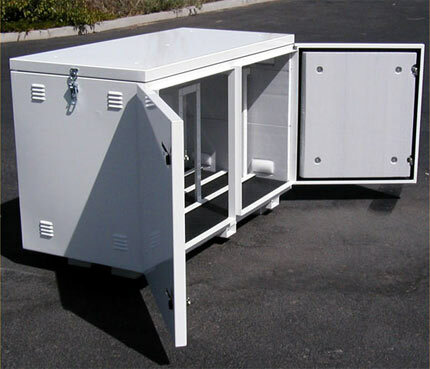 24 or 48VDC or PoE systems need transformers and matched pairs of solar panels and batteries. AC powered devices will require a DC to AC inverter which adds cost. Transformers or inverters add cost and inefficiency to system. Use fixed cameras as opposed to PTZ’s whenever possible. Try to use environmentally sealed cameras that do not require internal heaters or fans. If nighttime surveillance is critical to the installation, consider using low light cameras instead of conventional day/night cameras and illuminators. 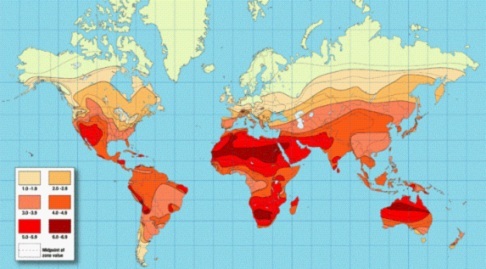 Solar power can still be used in lighter areas of the map but will require larger solar panel arrays, increasing the system cost. Climate – In colder climates, batteries are less efficient and are de-rated in the battery sizing calculations. The estimated number of consecutive sunless days needs to be factored in the calculation so that the batteries will provide power during this period without receiving a charge from the solar panels. As we have shown with our examples, due to the variation in sizes of solar panels, charge controllers, batteries, insolation and climate, solar power systems do not scale very well. Do not try to extrapolate data or estimate costs and sizes based on the above tables. It is recommended that you contact a solar power system manufacturer to get an accurate design and estimate tailored for your particular application. Although advances in solar panel and battery manufacturing technology and market competitiveness are steadily lowering the price of solar power systems, they are still widely considered to be expensive or not aesthetically pleasing for use with surveillance systems. They should be used when other sources of power are unavailable or are economically impractical, or when environmental concerns or camera portability requires their use. Minimizing the power consumption of the surveillance hardware will have the greatest effect on reducing the overall solar power system cost. Solar power systems are most cost-effective when installed in climates with greater hours of direct sunlight. As each installation is unique, solar power systems should be professionally designed and estimated for the specific load, location and climate of the installation, as the pricing does not scale in a linear fashion.